NORTHERN ENCLOSURE LODGE is a four season chalet located only five minutes from Boyne Highlands and Nubs Nob ski areas and the quaint villages of Harbor Springs and Petoskey. Northern Michigan, much admired for its superb skiing, is also known as a fabulous summer destination. Our home is within minutes of the beautiful sandy beach and dunes of Petoskey State Park on Lake Michigan. We are close to many inland lakes and canals, ideal for swimming and boating; slow meandering streams, perfect for canoeing; and 20 championship golf courses. Many of our guests visit the famous tourist destination of Mackinac Island, located in the nearby Straits of Mackinac. The chalet is a cozy, three level, rustic lodge. It features a loft with two bedrooms, a first floor master bedroom, and a walk-out lower level with another bedroom. There are two bathrooms, utility area, and a large rec/media room that will accommodate your entire party. We are a family of die-hard Northern Michigan lovers that discovered this wonderful area as Honeymooners in 1969 and have returned every summer and winter since. We finally were able to purchase our own retreat and keep finding new places and experiences as well as frequenting old favorites! We were drawn to this house because of it's great location , the skiing and summer activities, the relaxed atmosphere, and yes, I confess, I love knotty pine! After many upgrades over the years , I feel that we have established an atmosphere that not only we enjoy but others will as well when they visit. Make your own memories in this wonderful area from our comfortable and cozy lodge. Children love the loft and judging from our now 3 or 4 guest memory books, all seem to enjoy their stays. Guests provide their own bed sheets/pillow cases and towels which helps to keep our rates low and maintains each guest's own standard of quality as well. Blankets and pillows provided. Well stocked, cooking oil, basic spices, condiments, measuring cups, utensils ,mixer, cutlery, crockpot, griddle top, cutting boards. Service for 12. See "Pantry"
Service for 12, kitchen is well stocked for cooking in, new cookware, crock pot, gas stove/oven. On walk-out level, table for board games /cards, TV dvr, videos, mini library. Many courses in the area, Highlands within 1/2 mile. 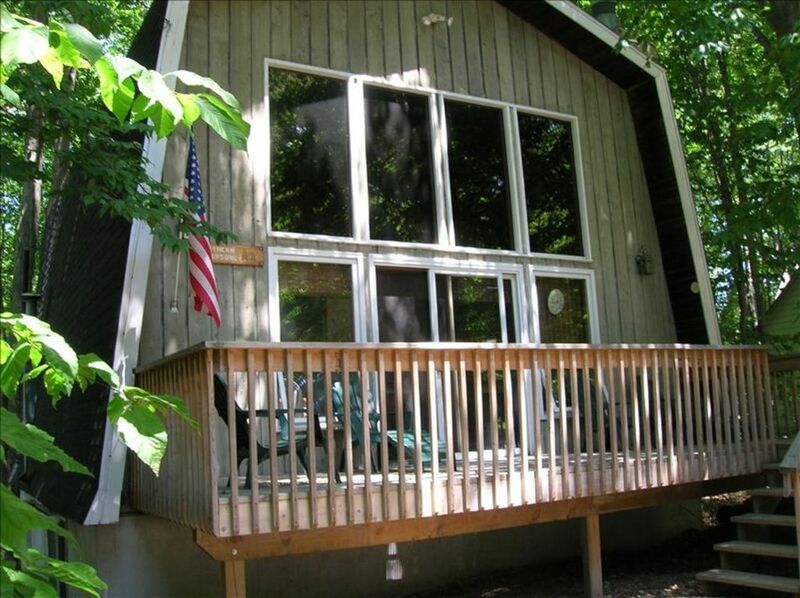 Chalet is located in a heavily wooded area, with decks front and rear, three levels, 1600+ sq feet, cozy lodge atmosphere. New flat screen tvs, wifi, two villages close by, 5 minutes to two great ski areas, golf! Fire wood provided . Your quintessential up North ski chalet! We had a lovely time spending a couple of days at the Northern Enclosure Lodge. It was very nicely decorated and well organized. It has an authentic northern charm with a cozy feel. Walking out and seeing the ski hill was an added bonus. I thought it was quite nice that they had provided firewood for the stay - excellent detail. Bill and Chris were very friendly, responsive and made us feel welcome. We would certainly stay again. Thank you for sharing your place with us! We had a great time. The location is perfect for skiing. Great place! Perfect location for a ski trip with friends or family. Clean. Good communication. Thank you Rob! What a banner season for skiing , we hope that you and your party can return! To be honest, before entering the home we were a little skeptical. We had to bring our own sheets, and for 9 beds that is a lot. We had to sign a relatively lengthy house rules document. The physical keys were mailed to us via USPS. We were required to spend extra on postage to send them back afterward...These little things kept adding up and made us weary. Other websites make things a little more electronic and promote user-friendly techniques. But once we arrived, we were pleasantly surprised with the quaintness of the home, the spacious rooms, and the perfect location. This is one of those places you want to return to. Now that we are able to know what to expect and can prepare for the trip we are looking forward to booking next year. Thank you for your kind review and comments. We strive to communicate with our guests electronically, a follow up to VRBO, but if we do not receive a response, we send a copy of our confirmation along with opening and closing directions and a local map. The purpose of the confirmation is to check the accuracy of the rental dates and mailing address for the keys. We want our guests to understand our stated policies of our rental home prior to their visit. Postage will be provided in the future for key return as suggested! As stated on our site, linens are provided by our guests for several reasons; We would have to stock 27 sets to keep in rotation for 9 beds; Doing so, rates are reduced and guests are assured that their own standards are being met. If only the cost of lift tickets could be reduced! This is the 2nd time we've stayed at Northern Enclosure - that says it all right there. It's perfect for a ski trip to either Boyne Highlands or Nubs Nob (or both which is what we did). We had 3 great days of skiing with good early January snow. We were concerned about warmer temperatures but all lifts and trails were open. Fires in the fireplace at Northern Enclosure after a day on Michigan's best slopes were perfect. Thank you Scott! We forgot to waive the security deposit this time, but will do so next time, Home Away et al. will be returning it soon. Perfect place for a family ski trip. Northern Enclosure was equipped with everything you need to relax and enjoy your time away. Plenty of room with extra space in lower area if people want to stay up late. Close to both ski resorts. We loved the fireplace and plenty of wood. Thanks for sharing your beautiful and cozy home. Thank you so much for you kind remarks! We hope that you are able to return!